The warm climate and the traditional hospitality of Turkish people plus the eternal intimacy between Anatolia and the mediterranean, Aegean sea. Crewed yacht charter in Turkey waters with endless visions of deep blue skies and sparkling chrystal waters with breathtaking scenery. crewed yacht in Turkey is not only possible but well affordable compared to Antibes, cannes or monaco with silver plate service. is dedicated to bring the best so that you can experience the magic of Turkey on your luxurious floating villa. 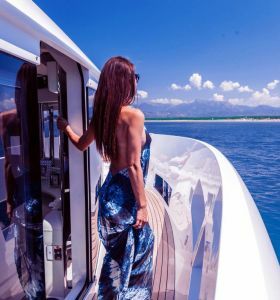 Crewed yacht charter in Turkey yacht cruise the hundreds of miles of picturesque, unspoiled and uncrowded coastline, cooling off and swimming in sparkling clear waters, sipping an icy coctail on board one of our yacht where we assure your privacy and unrivalled comfort. If your dreams are endowed with too much imagination and you would like to be served dinner by candlelight under the stars or breakfast in the morning sun, then do not think twice , Turkey offers such a holiday. Crewed yacht charter with luxury yacht charter, sailing or traditional style The choices are endless, crewed yacht charter Turkey portfolios are huge, the price range is immense and the itineraries open for you to choose amonst the best in the world. 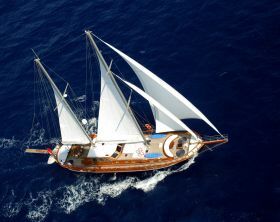 A gulet is Traditionally all wooden motor sailing yachts built for cruising in the warm waters of the eastern Mediterranean. These yachts are built to center life on deck during the charter. spacious decks and housing a large (usually) aft half mooned shaped dining and lounging area are their main features. 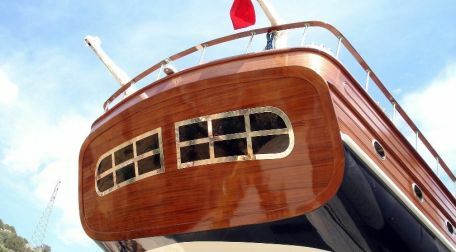 However lately the new generation crewed gulet charter Turkey are built with state of the art technology and they all come in with full air conditioning, hot cold water and even with jacuzzi on board. 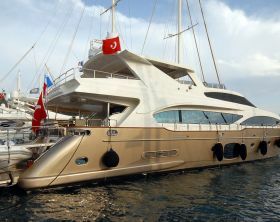 They are the rolls royce of the crewed yacht charter Turkey. A Crewed gulet can be compared to a small floating hotel, there are double berths in each cabin and occasionally, upper bunks, Every cabin has its own shower. The crew sleeps and uses the facilities in their separate cabins. Common quarters include a large saloon, a fully equipped galley operated by a cook, lots of uncluttered deck space, sun mattresses strewn all over to laze on while tanning. with a Round sterned gulet have a mattress covered perch in the aft that is called a “pigeon’s nest”, the most comfortable place to lounge or nap on the boat, protected by awnings. Unlike a bareboat, which is often limited in water supply, a gulet charter offers the chance to wash off the salt after every swimming party, as they can store up to 5 tons of fresh water. Choosing the yacht, the more important is issue is not the year of build but the technical condition of the vessel. .
Yacht for sale with Gulets are synonymous with yacht charter as well as Bodrum with magnificent gulet. Bodrum is well known for its boatyards such as (colak) erol Agan who built world famous gulets as Anabella. 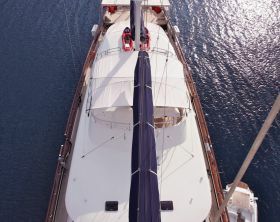 We have the richest crewed charter gulet Turkey portfolio built in Bodrum since they are the best among the rest…! Bodrum yacht industry is updated with latest technology and modern interior designers, Competing with dutch and german boatyards.